Blog Quick Quotes: Always Believe with Donna! Hi everyone, Donna here today to host the blog! 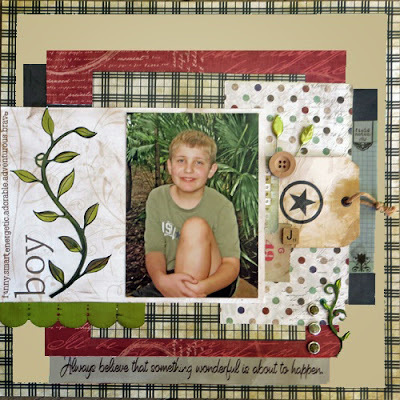 I've got a layout I did with lots of layers using Quick Quotes papers, some embellishments and recycled products! There are two items I repurposed, see if you can spot them out! I will let you know what they are at the bottom of this post. I also used Quick Quotes Java Powderpuff Ink, my favorite one in the long list of inks from Quick Quotes. Quick Quotes Club Q embellishments from past kits. Misc embellishments Kaiser Kraft brads Flourish with a Bling And my two recycled products are The tag with the star from Converse jeans and Quick Quotes packaging from Garden Bag-O-Chips. Great layout Donna! I love how you mixed all the different patterned papers!! Sweet photo, too!